I've been letting the titles stack up in the Jalopnik Book Review On-Deck Circle- including a really intimidating 75-pound slab of onanic Porschism- so let's get back into this book-review thing with a fun one! 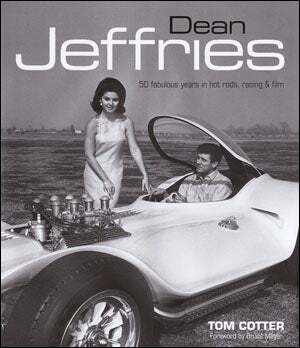 Jeffries isn't quite the showman and self-promoter that some of his car-customizing peers of the era were, so his contribution to the canon of amazing machinery to come out of postwar Southern California doesn't always get the recognition it deserves. In addition to building the Monkeemobile, Damnation Alley Landmaster, and the Green Hornet Black Beauty Imperial, Jeffries painted the first-ever AC Cobra and did the striping and lettering on huge quantities of Indy 500 racers… and that's just scratching the surface. One of the first things we learn about Jeffries is the type of car that got him started: a late-30s Horch sedan! He was in the Army in the early 1950s, stationed in Germany, and acquired this Teutonic proto-Audi monster for road trips around Western Europe. Once he'd installed straight pipes on it, he learned to paint stripes from an old German furniture maker (a story reminiscent of Jimmy Bryant picking up guitar tips from Django Reinhardt while in a French military hospital during the war). This is a coffee-table book full of pretty photographs of greasy LA boys putting together works of art that today's ironic hipsters will spend their entires lives attempting to emulate, but author Tom Cotter went ahead and wrote a proper biography of Jeffries for those eggheaded types who actually, like, read words. Cotter, as 24 Hours Of LeMons insiders know, is the author of The Hemi In The Barn, the book the LeMons Supreme Court uses for the "Preach To The Converted" penalty; miscreants must read aloud the account of a racing Pinto rescued from oblivion, and they must do it with passion. The Mantaray and Monkeemobile get plenty of coverage- in part thanks to Jeffries' diligence with a camera, documenting his projects as he went along- but I'd have preferred to get more of the dirt on the feud between Jeffries and former employer George Barris (involving credit for the design of the Monkeemobile, among other things). That's just me, though; those who don't hunger so much for sinuendo will be perfectly satisfied. I'm giving this one a Jalopnik Three Rod rating. Murilee says check it out!